Policies that index the minimum wage to inflation are becoming politically popular. Whether enacted through ballot initiatives or added as provisions on traditional minimum wage proposals, advocates have stepped up their efforts in recent years to tie wage hikes to specific economic indicators, such as the Consumer Price Index (CPI). President Barack Obama’s proposals to combat poverty include mandating a $9.50 minimum wage by 2011 and indexing the wage thereafter. The earliest example of an indexed wage policy was introduced in 1999, when Washington State voters passed a ballot initiative to begin automating annual wage hikes. Ballot initiatives in Oregon, Florida, and San Francisco, CA, soon followed Washington’s lead. In 2006, voters approved minimum wage increases with automatic escalators in six states: Arizona, Colorado, Missouri, Montana, Nevada, and Ohio. These ballot initiatives were part of a larger, get-out-the-vote strategy devised by labor activists. Vermont is the only state to have passed automatic indexing through the legislative process, but it’s happening at the local level as well; lawmakers in Santa Fe have also approved indexing their citywide minimum wage. The arguments that favor indexing are simplistic. Advocates claim indexing helps low-wage workers keep up with the rising cost of living and and gives employers “certainty” regarding when to expect wage increases. Additionally, automatically raising the minimum wage every year keeps a divisive issue off the legislative calendar. In spite of their popularity among voters, mandated wage increases have repeatedly proven to be vastly inefficient as a means of helping the entry-level workforce, particularly since the majority of those who benefit from minimum wage hikes are not impoverished or supporting a family. Moreover, there is a general consensus that forced wage hikes lead employers of entry-level workers to eliminate jobs or reduce hours. Even if jobs are not cut, companies respond to higher labor costs by shifting their hiring focus to skilled employees or more capital-intensive production, leaving the least skilled workers out of the labor market. 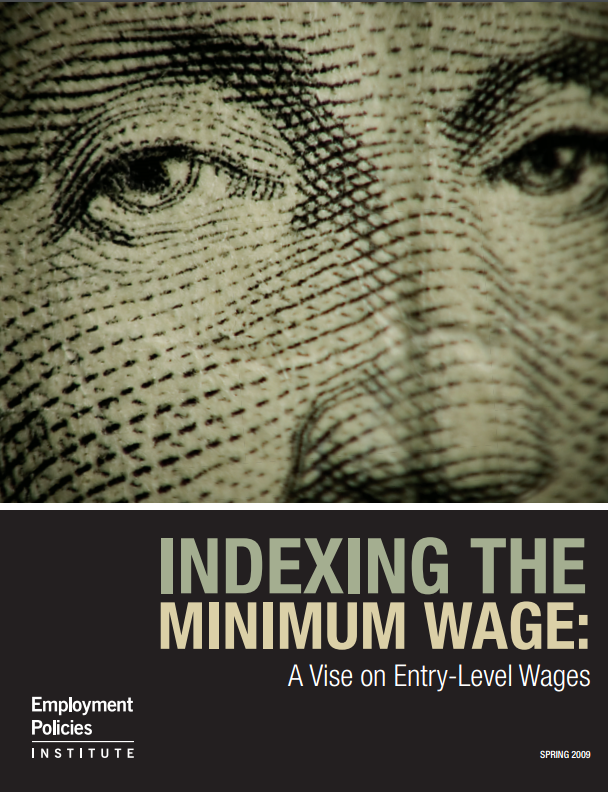 In reality, indexing puts into motion an unending cycle of rising labor costs and reduced job growth, the annual disappearance of job opportunities for entry-level workers, and constant pressure on prices. Yet all these negative effects occur without any measurable reduction in poverty—-the stated goal of supporters of minimum wage hikes. This white paper examines the experiences states have had with automated annual indexing and discusses the consequences this policy has had on the entry-level workforce.